Our Collection Guide will help you navigate our Semi-Custom Collection process and the customization options available. We encourage you to read and refer to this guide while preparing to submitting your invitation order. Our Semi-Custom Collection offers a range of thoughtfully designed suites. Each suite allows customization options for Printing Method, Paper Type, Envelope Color and Ink Color. To begin the process we recommend that you explore our Collection and choose a suite that reflects your unique aesthetic. As you prepare to place your order, it is important to consider your wording and color choices. During the ordering process you will be asked to complete a detailed form to capture the information we will use to create your personalized suite that features your wording, style and color selections. Once your order has been placed and your information collected, the design process begins right away. When choosing your suite we encourage you to consider your selections carefully before placing your order. We will follow up within 5 to 10 business days with a digital proof featuring your unique selections. Once you have reviewed your digital proof, you can either approve for printing or request changes. One round of revisions is included with your order, any adjustments after this round can be made for a fee. Once your proof has been approved, production begins. We will follow up when production is completed and your goods are ready to ship. Digital printing creates a flat, smooth finish on top of paper. Digital printing is our method of choice when selecting our 110lb cotton paper option. Digitally printed stationery takes approximately 4-5 weeks upon approval, plus shipping. Letterpress printing creates a beautiful, pillow-like impression in paper with solid, matte inks. This printing method is available for our 220lb cotton paper and handmade paper. Letterpress printed stationery takes approximately 6-8 weeks upon approval, plus shipping. Foil printing is the process of laying a sheet of metallic foil on paper that is then pressed with a metal plate. This method is available for our 220lb cotton paper and handmade paper. Foil printed stationery takes approximately 6-8 weeks upon approval, plus shipping. Our 110lb Cotton is our paper of choice for digital printing and features clean, smooth edges with a softly textured finish. Our 110lb cotton pairs well with our vellum wraps. Our 220lb Cotton is beautifully thick with a gentle eggshell finish. This paper is ideal for letterpress and foil printing for it's ability to create a pillowy impression. Our handmade paper features a softly, textured surface and natural deckled edges. 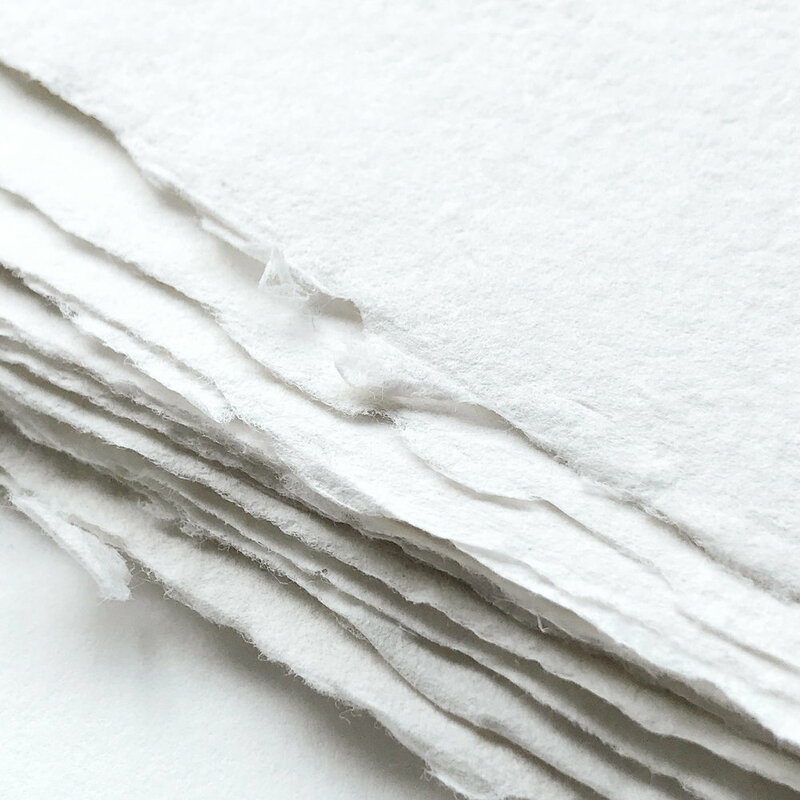 Our handmade paper is well suited for a delicate letterpress impression. Our cardstock envelopes feature clean, smooth edges in a variety of colors to coordinate with your unique color scheme. Our cardstock envelopes pair beautifully with both our 110lb and 220lb Cotton Papers. Our handmade envelopes feature soft, naturally deckled edges in the colors listed below and are paired with our soft white handmade paper. Colored handmade envelopes are made to order and can add approximately 1-2 weeks to the timeline depending upon availability. The colors below are available for our Digital and Letterpress printing methods. * White is available as a letterpress blind impression and digitally for dark envelope return addresses. The colors below are available for our foil printing method for our 220lb Cotton and Handmade paper. Our wreath designs can be customized with or without calligraphy. Our Ardor and Muse Suites include an interchangeable wreath monogram to personalize your Invitation. We offer 4 different calligraphy script styles. Each with unique characteristics created to compliment your wedding aesthetic. Our Light & Modern style features all lowercase lettering with simple, quick movements. This script lends itself to a modern, yet organic style. Our Simple & Casual style features contrasting thick and thin strokes, creating character and a relaxed aesthetic. Our Flourished & Elegant style is timeless with traditional letter forms and flowing flourishes. Our Modern & Romantic style is both relaxed and elegant, with large looping descenders. Please inquire to request custom ink colors, typography styles, additional paper colors and printing methods that are not offered within the Semi-Custom invitation options.